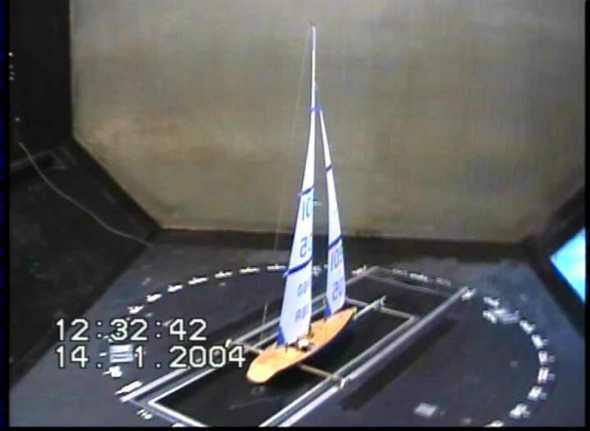 Alex Meredith-Hardy spent a couple of cold days in the wind tunnel in January 2004 gathering data on rig properties -- shrouds, hounds, and spreaders to be exact. It has taken me this long to explore his project report and bring you this summary! Sorry! The now-standard model of a Bantock "Jazz" was rigged with an IOM No.1 suit and pointed at 30 degrees to a variety of wind speeds. The No.1 rig was prepared with four hounds positions -- at the mast head, at the jibstay, at around 180 mm below the jibstay, and at around 350 below the jibstay. With the shrouds attached at the forestay, there were three spreader angles used -- 45 degrees, 22.5 degrees, and 0 degrees -- of that spreader length which gave parallel lower shrouds. Finally, there were four spreader lengths -- 9.5 cm, 7 cm, 4.5 cm, and 2 cm -- and the 9.5 cm spreader was used for the other runs where spreader length was held constant. Because "Jazz" is a relatively beamy design, the 9.5 cm spreaders gave shrouds which ran parallel for their lower part, and the 4.5 cm spreaders were "neutral", not deflecting the shrouds. The graph shows the results of plotting drive force against wind speed for various spreader lengths. • Below an apparent wind speed of 3 m/s the shortest spreaders (2 cm) give the best performance. • Above 3 m/s the longest spreaders (9.5 cm) give the best performance, closely followed by the 7 cm spreaders. • The theory of "ultra short" spreaders seems incorrect. Short spreaders did not result in a laterally straighter mast. They in fact caused excessive masthead sag due to insufficient support from shrouds. This caused a loss in sail shape. As a result, performance was considerably reduced in the higher wind speed range. Conclusion -- unless light airs can be guaranteed for the entire event, keep your spreaders long rather than short. The graph shows the results of plotting drive force against wind speed for various hounds positions. • Hounds at forestay attachment height give best performance. • Preventing masthead sag is more important than preventing mid-mast sag. • With the hounds at forestay attachment height, mid-mast sag actually helped to counteract masthead sag due to the pinning action of the spreaders on the mast. Conclusion -- attach your shrouds at or near the forestay attachment, unless you want to try something different. Mast head attachment seemed marginally better than a low shroud attachment point. The graph shows the results of plotting drive force against wind speed for various spreader "V" angles and two spreader lengths. • Over all, the long (9.5 cm) straight (0 degrees) spreaders marginally perform the best. • The extreme spreader angle of 45° did not give extreme results as expected. • In general, the long angled spreaders out perform the short ("neutral" length 4.5 cm) angled spreaders. • In the cases with angled spreaders, there is no evidence of changes in fore/aft mast bend with wind speed as was expected. • There is a difference in the behaviour of rigs with straight and angled spreaders. However, from the testing carried out, it is not possible to isolate what changes were occurring that caused the differences in behaviour. Conclusions: the spreader "V" seems to have little effect on overall boat performance, whether the spreaders are long or short, so use whatever you need to keep the mast bent the way you like it. The results are really surprising. However, I'm not fully convinced. I think that it should be very interesting to see the effects on heeling force in addition to that on driving force. I believe that the short spreaders are interesting because they power off the sail in the puff. So the driving force is less important, of course, but the heeling force should decrease also in an important way. The conclusions of the study may be opposite. Kostia is quite correct! So here are the graphs for the lift-to-drag ratios (the graphs have identical shape if we calculate drive to heel force), and for the heel force. In general, the heel force graphs have a similar pattern to the drive force graphs -- that is, if drive is low for a particular configuration, so is heel. In particular, the "ultra short" spreaders are the only ones to show a decrease in the lift to drag (equivalently drive to heel) ratio, which I interpret as supporting the earlier conclusions. That is, for the short spreaders, while the drive force drops off with increasing wind speed, the heel force does not drop off as quickly, and while the end result might be less heel we are worse off because of the more than corresponding drop in drive. Considering hounds position, lift to drag ratio drops for all the hounds positions, but drops off more for the forestay position. Interesting, because nevertheless the forestay position is always superior in lift-to-drag ratio, even if it does drop off more dramatically. And for spreader "V", well, nothing much going on there, it seems to me that the lift-to-drag ratio changes are within experimental noise.